Eide Chrysler is the successor to Corwin Churchill Motors, which was one of the nation’s first Chrysler dealerships. Minot-based Ryan Auto Group purchased Corwin Churchill Motors in 2010. The dealership changed ownership again, in 2016, to Bismarck-based Eide. 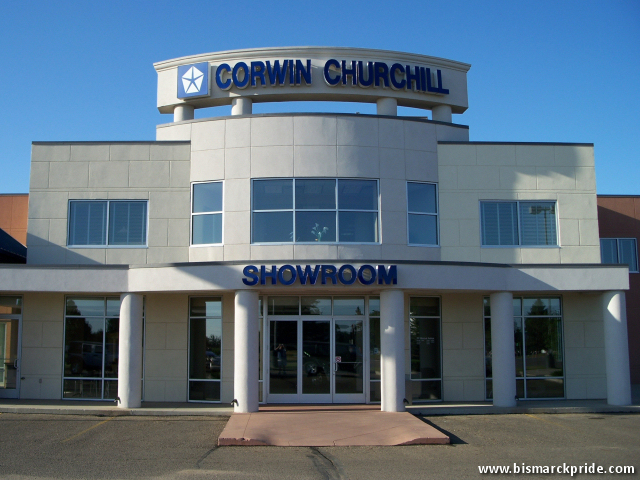 Corwin-Churchill was also an Appliance dealer in downtown Bismarck, operating from 1935-2015. Founded in 1914 by Samuel Wickham Corwin, the dealership originally sold Buick, Saxon and Mitchell automobile brands before becoming one of the first distributors of the Chrysler nameplate when it was introduced in 1924. One year later, Neil Churchill joined the dealership. In 1937, the company purchased Murphy Motor in Fargo, greatly expanding the dealership. Corwin moved to Fargo to head up operations at its new dealership, while Churchill continued to manage the Bismarck location. During World War II, the company temporarily switched its focus on wholesale automobile parts distribution. Churchill retired in 1952 and sold his interest to the Corwin family. The Whittey family purchased the Bismarck dealership from the Corwins six years later, in 1958, and continued its operation for the next five decades. Corwin Churchill has had two locations in Bismarck, the first being downtown. Its current facility was completed in 1998 and coexisted with the downtown location for a short time. The former downtown building was completely destroyed by fire in November 2003. While suspicious, investigators could not prove the fire was arson. In 2010, Corwin-Churchill Motors was purchased by Minot-based Ryan Auto Group, who renamed the dealership Ryan Dodge. The new name signaled the company’s intention to apply a greater emphasis on the Dodge lineup, which was newly acquired from Cedric Theel, versus its legacy Chrysler line. Longtime Bismarck dealership Eide Ford purchased the dealership in 2016, re-branding it as Eide Chrysler.